Give yourself (or a friend) the gift of a spa vacation right in your own home with Lavender, Chamomile & Lavender and Coconut Milk & Lavender bath bombs and skin-softening bath oils. Imagine the stress relief you'll receive with a long, luxurious soak in a fragrant bath. No boss or kids or co-workers demanding your attention. No deadlines to meet. No arguments to referee. Just a few minutes of relaxing "you" time thanks to a beautifully scented fizzy bath bomb from Tatum & Shea. One handmade fizzy bath bomb in a warm tub is enough to relieve those tired muscles, soften your skin, and leave you feeling as if you've spent a day at the spa. Be careful, though. These luscious bath essentials are so soothing, even the men in your life will suddenly crave a soak in the tub. Click "add to cart" to treat yourself, and remember to order a set for your hard-working friends, too. Beautifully packaged and perfect for gift giving to someone special ... a friend or for yourself. 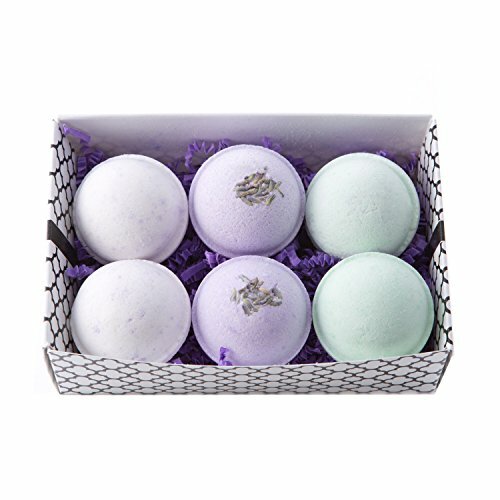 Fragrant Lavender, Chamomile and Coconut Milk & Lavender bombs (6 total) turn your bath into a luxury spa. Light oil leaves your skin feeling baby soft without the greasy feel other bath bombs can cause. Proudly handmade in the US in small batches with the finest cruelty-free, quality ingredients. No after-bath cleanup required. Colors dissolve completely without leaving a ring in your tub. If you have any questions about this product by Tatum & Shea, contact us by completing and submitting the form below. If you are looking for a specif part number, please include it with your message.